Web development trends have changed drastically over the last few years and as a web developer, to be at the top of your game, it’s important to stay updated with latest technologies. The heart of Node.js is based on event-driven programming; a programmer should therefore understand what events are available and how to respond to them. It uses an asynchronous event-driven, non-blocking I/O model of execution, which improves an application’s throughput and supports scalability for real-world web applications. It is single threaded so it can only use 1 CPU at any given time. A node.js web application is a complete web server for example Nginx or Apache. It supports threads via the child_process.fork() API, for spawning child process, and also offers a cluster module. Once you have installed Node.js, you’re ready to go. First start by creating a directory that will store your application files. 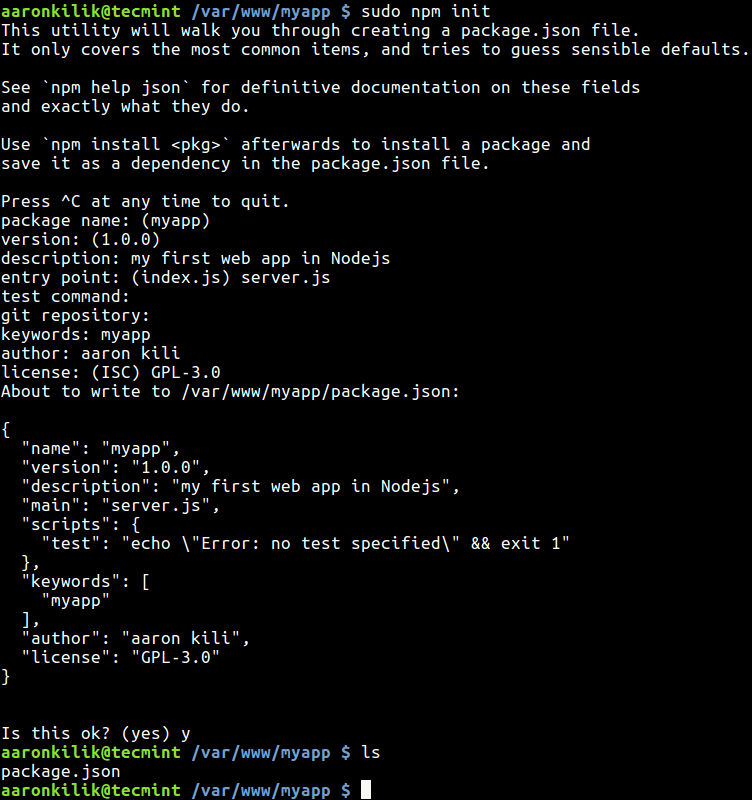 Then move into that directory and create a package.json file for your application. This file helps as a small documentation for your project: name of project, author, list of packages it depends on and so on. This will ask you a number of questions, simply answer as described below, and press [Enter]. Note that the most important things in the package.json are the name and version fields as explained below. package name – your app name, defaults to the directory name. version – version of your app. description – write a short description for your app. entry point – sets the default packages file to be executed. test command – used to create a test script (defaults to an empty script). git repository – define a Git repository (if you have one). keywords – set keywords, important for other users to identify your package on npm. author – specifies author name, put your name here. license – specify a license for your app/package. Next, create a server.js file. Copy and paste the code below in it. Next, start your application using following command. In our code above, the main event that is being processed is an HTTP request via the HTTP module. To call modules in your app, use the require function as shown. Once the http module is included, it will create a server that listens on a particular port (3333 in this example). The http.creatServer method creates the actual http server which accepts a function (which is invoked when a client tries to access the app) as an argument. The function in http.createServer has two arguments: req(request) and res(response). The req argument is the request from a user or client and the res argument sends a reply to the client. The final part of the code sends output to the console, once the server is launched. In this section, I will explain one of the most important concepts under Node.js programming known as routing (comparable to routing under computer networking: process of finding a path for traffic in a network). Here, routing is a technique of handling a client’s request; serving the content the client has requested for, as specified in the URL. A URL is made up of a path and query string. To view a client’s request query string, we can add the lines below in our response. Below is the new code. Save the file and start your application again using following command. 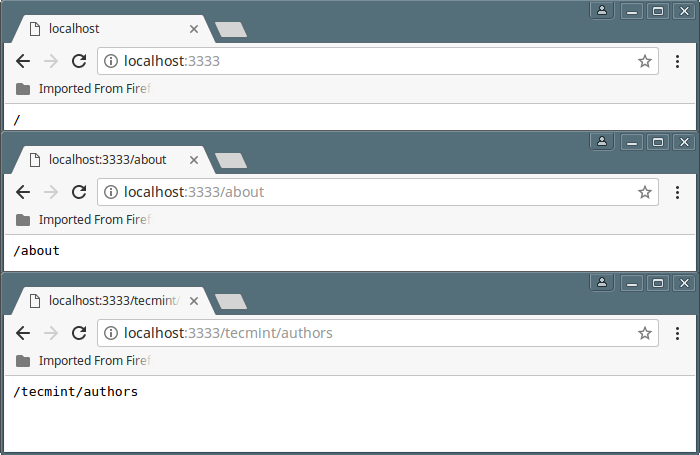 From a web browser, type different URLs which will be displayed as shown below. 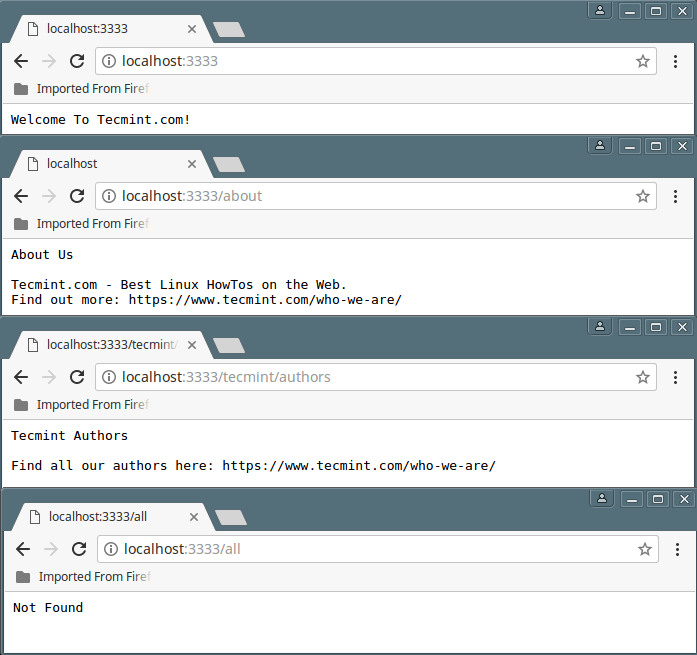 Now, we will create a really small website for Tecmint with a homepage, about and authors pages. We will display some information on these pages. Open the server.js file for editing, and add the code below in it. In the above code, we have seen how to write comments in Node.js using the // characters and also introduced switch and case statements for routing client requests. Save the file, start the server and try accessing the various pages. That’s it for now! You can find more information at Nodejs and NPM websites. Node.js is rising to new highs today, it has made full-stack development much easier than before. It’s unique philosophy of event-driven programming enables you to create lightning fast, efficient and scalable web processes and servers. Next, we will explain Node.js frameworks, which extend its native capabilities for quickly and reliably developing web/mobile applications. Do share your thoughts about this article via the comment section below. Aaron thanks! It worked like a charm and was helpful for understanding node a bit more. Looking forward to the Frameworks How-to! Thanks, fun to read, compactly written and give me an excellent first impression. Okay, we will create a guide about Node.js frameworks. Thanks for the heads up, we will check the code and proofread all future codes. I guess this is a good way to create a restful API type of app? Yes, it should be, thanks for the feedback.